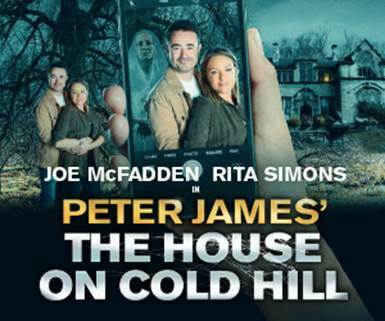 Eastender’s Rita Simons is to join the previously announced Joe McFadden in the world premiere production of Peter James’ spine-chilling The House on Cold Hill which is to run at Theatre Royal, Glasgow next spring. The TV favourites will be take to the stage from Tuesday 28 May until Saturday 1 June 2019 alongside Eastender’s Charlie Clements and Hollyoaks’ Persephone Swales-Dawson, who is making her professional stage debut. Strictly Come Dancing champion Joe McFadden (The Crow Road, Heartbeat, Holby City) will play Ollie Harcourt with Rita Simmons as his wife, Caro Harcourt, will be award winning actress Rita Simons, (Roxie Mitchell in Eastenders, Legally Blonde the Musical), with Charlie Clements ‘Bradley in EastEnders) as Chris, and Persephone Swales-Dawson (villainess Nico Blake in Hollyoaks) as Jade, making her professional stage debut. Adapted from Peter James’ best-selling novel based on his own experience in a haunted house. The House on Cold Hill is a modern-day ghostly thriller that will send shivers down your spine and make you think twice about returning home to a dark, empty house after the show! The House on Cold Hill will reunite Peter James with two time Olivier-nominated theatre producer Joshua Andrews, the Olivier award winning director Ian Talbot and award-winning writer Shaun McKenna. Also joining the company are Padraig Lynch as ‘Fortinbras’, Tricia Deighton as ‘Annie’ and understudy Zoe Hickson, with further casting to be confirmed. 0844 871 7648* calls cost up to 7 p per minute plus your phone company’s access charge.